Office of War Information Poster No. 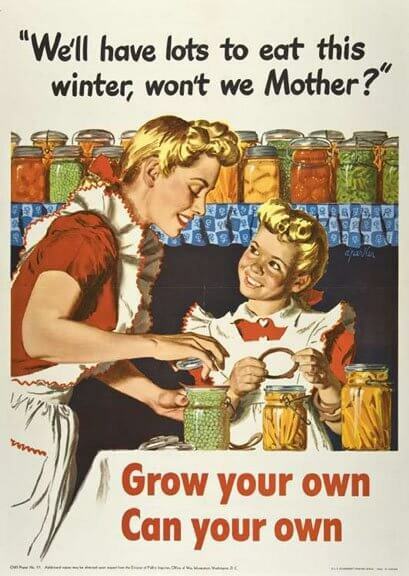 57, “We’ll have lots to eat this winter, won’t we mother?” Alfred Parker (1906–1985), graphic designer. (Washington, D.C.: United States Office of War Information, Division of Public Inquires, 1943). Promised gift to Historic New England from private collection. Used on this site with permission from Historic New England. Erica Donnis is an independent historian and museum consultant based in Burlington, Vermont. This is the first installment in her week-long look at America’s Kitchens — which now encompasses both a book and a national traveling exhibition. I learned to can as child–that’s what we did. Haven’t done it for years, but last year, my mom/sis and I started canning and making jams again. We had to teach my nieces the joy of making jam….you must also make a fresh loaf of bread for which to eat the ‘scum’ of the jam that comes off the top. This year we grew our own blackberries, blueberries and strawberries. We canned 35 jars of jam…how much money we saved by doing it all ourselves!! Even last years strawberry jam that didn’t ‘jell’ is great as a syrup on oatmeal, or over ice cream.